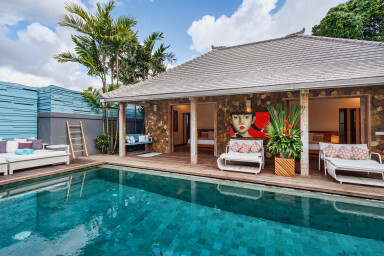 This wonderful three-bedroom luxury villa in Seminyak is located in a private alley just off Jalan Bidadari – an upmarket expat area a short drive from the centre of Bali’s favourite beach town. Villa Yang Tao 4 consists of two separate buildings ¬– a main building which hosts the living and dining space, kitchen and double bedroom; and a building on the opposite side of the pool with two master bedrooms. The living space is playfully decorated and is a perfect spot for catching up after a long day of shopping or lying on the beach. There’s a large wooden dining table which seats six people. The two master bedrooms have air conditioning, a huge walk-in closet, king-size bed and a very large ensuite bathroom with a beautiful stone bath tub, double sink and a separate rain shower. The double bedroom comes with air conditioning, queen-size bed with air-conditioned climitized. Its ensuite bathroom is with toilet, sink and rain shower. Covering an area of 400sqm the large pool and tropical garden really are the focal point of this villa. The large wooden sun deck make this a great spot for topping up your tan on one of the comfortable sun beds, or for romantic handholding at night with a freshly made cocktail in hand. There’s a fully equipped kitchen with all mod cons, including an oven and a large kitchen island which is perfect if you enjoy cooking. We’d very much recommend you let our private chef take care of the cooking instead, so you can focus on fully enjoying your holiday. At an additional cost she’ll prepare you the most delicious daily breakfasts, lunches and/or dinners. She’ll also gladly throw in a little masterclass in Indonesian cooking – perfect if you want to impress the crowd back home. What a great stay we had, even though 4 nights was too short ! The villa is lovely, perfect setting for a group of 5 like us. Apparently, the villa was just renovated and all worked great. 3 bedrooms around the pool, very large bathrooms, semi open and many lounge beds around the pool, it was perfect to relax. We arrived late but Wayan was there to welcome us (glad that we took Benjamin's driver to pick us up), there was also a night security for the complex which was great. The villa is not exactly in the center of Seminyak but we rented some scooters so it was very easy. We also got a couple of taxis that came fast. We were given a mobile phone and many tips on what to see and do. We had a great day tour rafting too that Dolla organised for us. Ketut the maid was lovely and the villa was super clean all the time. We cannot wait to come back ! We have the most enjoyable stay at Villa Yang Tao 4 during our holiday. Especially after moved from Lombok due to earthquake evacuation, calm and tranquil place is all we need and we got it all from this villa. We can just relax at the villa or its just a short ride to the central Seminyak with taxi or even walking. The Bali Agent team always easy to reach and will trying their best to make sure we have a pleasant stay. Definitely 5* hospitality! Thank you! Villa yang tao was exactly like u see in the pics. Very comfy and outstanding clean, 2 rooms have an outside bathrooms which are very nice. Wayang, Dolla and Ketut were amazing hosts. The Villa is an excellent escape from Seminyaks hustle. We enjoyed our stay there and recommend it for couples, friends or families. My friends and I were greeted at the door by the lovely Dolla and were welcomed to fresh watermelon juice. We were blown away as soon as we stepped into the villa. Everything was immaculate. We have stayed in two other villas in Bali before this one, and Benjamin's villa was the icing on the cake. We couldn't ask for more. There were so many thoughtful touches, which many would overlook but made our stay so much more comfortable, such as providing international adapters, information booklets about various activities, tours, information on drivers, on which ATMs to use, which taxis you should flag down, the number of the masseuse that will come right to the villa and provide massages! The massages were so cheap, so worth it and so perfect. I would definitely recommend. The maid so lovely and sweet and always asked if we needed anything. Dolla was also so helpful, and was able to help us rent motorbikes within minutes of checking in. Benjamin was also kind enough to let us check out of the villa much later than usual (at 7pm!) because of our late night flight. It was so unexpected and so sweet of him! Although it has only been a few day since I got back from Bali, I am already thinking about a trip back to Bali and staying exactly at this villa. Huge thanks to Benjamin and his team. It is indeed a great place to stay! All photos uploaded at Airbnb are exactly the same as its actual conditions, definitely clean and spacious villa, parking spot available, located on a strategic location (near Babi Guling Pak Malen), nice pool, friendly staff too. No words could describe how happy we were staying here, really love it very much! Very clean and good service Everythig is perfect !